El Cid written by an Arab poet, historian says - The medieval epic poem "El Cantar del Mio Cid" (The Song of the Cid), a Spanish-language account of the adventures of a warlord and nobleman during the Christian Reconquest of the Iberian Peninsula from the Muslims, is not as Spanish as generally believed but instead was written by a Arab poet, a scholar says. Village in England for Sale - Linkenholt, a village in Hampshire, is on sale for 22.5 million pounds. Includes a video report. The Rap Canterbury Tales - Baba Brinkman, a Canadian rapper and Chaucer scholar, will perform The Rap Canterbury Tales on Wednesday, April 1, at 7:30 p.m. at Indiana University. Searching for Roman walls in Gloucester - an archaeological investigation in the centre of Gloucester has discovered that medieval settlers used parts of a Roman wall to construct buildings in the city. The Catapult Connection: The Invention of and Inventing in the Middle Ages - Dr. Jason Hardgrave, assistant professor of history, will present "The Catapult Connection: The Invention of and Inventing in the Middle Ages" at the USI Medieval Studies Forum at the University of Southern Indiana. The medieval epic poem "El Cantar del Mio Cid" (The Song of the Cid), a Spanish-language account of the adventures of a warlord and nobleman during the Christian Reconquest of the Iberian Peninsula from the Muslims, is not as Spanish as generally believed but instead was written by a Arab poet, a scholar says. Dolores Oliver, a Spanish professor of Arabic and Islamic Studies at the University of Valladolid, claims in her book "El Cantar del Mio Cid: genesis y autoria arabe" (The Song of the Cid: Arabic Origin and Authorship) that Arabic poet and jurist Abu I-Walid al-Waqqashi conceived the epic as political propaganda in the service of his Spanish Christian patron. "There was a pact between them" - Oliver told Efe in an interview - whereby the poet wrote the work "to immortalize" his Cid Campeador. The latter, whose real name was Rodrigo Diaz de Vivar, pledged in turn to "respect the beliefs of the Muslims of Valencia," which he had conquered. Described by both Christian and Muslim chroniclers as one of the wisest men of his time, Al-Waqqashi composed the work in the Valencian court and, according to Oliver, it "began to be recited in 1095, a year after Diaz de Vivar conquered the city, which had been under Arab rule since the 8th century. The scholar said she began investigating the authorship of the anonymous epic poem on a "casual" basis after being invited to participate in a seminar in 1984. "Then I started reading the 'Cantar,' which I had read during my years as a student, and as I was reading I began saying 'this came from the mind of an Arab,'" said Oliver, who confessed that she did not even believe that theory at first and refused to touch the subject for two years "because I was afraid of it." But she revisited it periodically until finally taking up the challenge of proving the thesis, convinced that "the only explanation for all of the content of the 'Cantar' was (that it was written by) an Arab poet at the service of a Castilian lord." "As a poet, his birth and formation would have allowed him to describe (heroic) battles, like those of the 'Cantar,' and touch on topics of Bedouin poetry," the professor said. Among the arguments in favor of her theory, she mentioned the religious climate described in the epic poem. "A poem where the Christians are not the good guys and the Muslims are not the bad guys had to have been written in an era of tolerance, in the era of the Cid," Oliver said, adding that after the death of the Campeador, in 1099, "a feeling of hostility" emerged toward Muslims. The last Muslim city fell to the Catholics in 1492 and, between that year and 1610, an estimated 3,000,000 Muslims voluntarily left or were expelled from Spain. Because of the growing intolerance, the scholar said the "Cantar" could not have been written in 1207, the most traditionally accepted date, nor in 1140, as the late Spanish philologist and historian Ramon Menendez Pidal contended. Oliver also rejects the argument that the custom of court poets recounting the exploits of their lords was unique to Al-Andalus (medieval Arab-occupied Spain), where all the rulers "had a poet to sing their glories." "Would the Cid, who had been in the court of Seville, in that of Zaragoza, be so foolish as not to take advantage of that political weapon?" the author asked rhetorically. Thirdly, Oliver pointed to the art of war described in the poem, including an equestrian technique "that only the Almoravids (a Berber dynasty from the Sahara that spread over a wide area of northwestern Africa and the Iberian peninsula during the 11th century) successfully practiced." She said it is called an "arrancada" in the "Cantar" but, in Oliver's opinion, the technique is none other than the Arabic "haraka." Oliver joked about how her thesis has been received and said it has been "very well accepted by medievalists or people who haven't spent their lives studying 'El Cid," adding that it also took her "many years" to believe it. The Paul and Jill Ruddock Gallery devoted to the Museum's pre-eminent collection of medieval material opened on March 25th. The third of four new galleries opening at the British Museum this year, the gallery is devoted to the British Museum's pre-eminent collection of medieval material. This gallery will place this great collection in its fullest historical context, integrating art with archaeology, covering the period from 1050–1500 AD. Some of the Museum's greatest British, European and Byzantine treasures will form the centrepieces for this new permanent space. Unique, spellbinding objects such as the celebrated Royal Gold Cup, made in Paris between about 1370–80 AD under the patronage of the (princely) Jean duc de Berry, will act as gateways to the wider world of noble pursuits afforded by rare survivals of royal art from the Palaces of Westminster and Clarendon. The intricately carved citole, a unique medieval English musical instrument, will serve as a platform from which to understand the rituals and protocols surrounding aristocratic amusement. Centre stage within this context are the world famous Lewis Chessmen (around 1150–1200 AD), poignant survivals of a sophisticated courtly culture that existed along the seaboard of northern Europe. Sacred art is equally well represented illustrating the major devotional developments of the age. The flourishing of the monasteries from the mid-eleventh century to their dissolution in the sixteenth is a topic given dramatic treatment from the Museum’s rich resource of objects associated with abbeys, priories and convents. The magnificent tiled pavement from Byland Abbey, North Yorkshire, will be displayed alongside important monastic sculpture from Lewes Priory in East Sussex. The fundamental notion of religious images acting as an aid to devotion is developed by combining precious objects from the Byzantine world with contemporaneous pieces from western Europe in a stirring analysis of how the divine was represented in two different but related Christian cultures. Icon painting and ivories are juxtaposed with wooden figure carvings and jewellery to explore the imagery of Christ and the Virgin and to illustrate the periods of iconoclasm which affected Byzantium and western Christendom equally. The Byzantine Empire was one of the major pivotal points on the medieval map. A section dedicated to Byzantium and its Neighbours examines its role as a trading capital and as a centre of intellectual and artistic ferment. Related displays developing the theme of internationalism demonstrate the vast movement of people and commodities around the medieval world at any one time by focussing on topics such as trade, pilgrimage and Crusade. All of the narratives are emphatically object-led and showcase many of the world’s greatest medieval treasures. A number of events will accompany the opening of the gallery including an introductory Gallery talk by curator James Robinson on Thursday 2 April and Music in the Medieval Gallery – a performance by singer Helen Barber and the Misericordia instrumentalists on Saturday 11 April. The gallery opening is accompanied by the publication of a new book Masterpieces of Medieval Art by the curator James Robinson. This magnificent book is the first illustrated guide to the highlights of this collection. The book is published by British Museum press, priced £19.99. Baba Brinkman, a Canadian rapper and Chaucer scholar, will perform The Rap Canterbury Tales on Wednesday, April 1, at 7:30 p.m. in the Frangipani Room of the Indiana Memorial Union. The concert is free and open to the public. A reception will follow in the Hutton Honors College, located at 811 E. Seventh St.
Brinkman began writing his own rap lyrics and competing in freestyle competitions at the age of 19. He earned both an undergraduate and a graduate degree in Medieval and Renaissance English literature, and his master's thesis discussed the similarities between the narrative structures of rap music and Chaucer's poetry. His research inspired him to write The Rap Canterbury Tales, which re-narrates Chaucer's classic tales of the Miller, the Pardoner and the Wife of Bath using the modern medium of rap to bring them to life for contemporary audiences. The Rap Canterbury Tales made its debut tour in 2004 and has since been recorded as an audio CD and published as an illustrated book. Brinkman has toured The Rap Canterbury Tales extensively, taking the show to Prague, Montreal, Edinburgh, Melbourne, New York, San Francisco, London and other major cities around the world. The success of The Rap Canterbury Tales prompted Cambridge University to sponsor a performance tour of the piece to more than 30 British high schools. Brinkman is currently in the midst of an American tour of The Rap Canterbury Tales at universities and other venues. Brinkman has released eight CDs of his original music. He began his own company (Babasword Productions) in 2004 and his own indie record label (Lit Fuse Records) in 2007. Brinkman has been featured on CBC, NPR, ABC and BBC Radio. When he is not touring, he lives in Vancouver, Canada. Brinkman's IU performance is cosponsored by the Department of English, the Hutton Honors College, the Medieval Studies Institute and the Renaissance Studies Program. For more information, contact Hannah Dubina at hdubina@indiana.edu or 812-855-5296. Archaeologists in Gloucester have unearthed evidence that recycling is not just a twenty-first century idea. An archaeological investigation in the centre of the city has discovered that medieval settlers used parts of a Roman wall to construct buildings. Gloucestershire County Council's archaeology team is exploring the area where Kimbrose Triangle meets Southgate Street before work begins in the summer to connect the Quays to the city centre. But they were frustrated in their search for the line of the old Roman wall. Gloucestershire County Council project officer Paul Nichols said: "We found Roman deposits about one metre below the pavement level. The earliest deposits were soil layers containing shards of Roman pottery and fragments of wall plaster. Above that was a mortar floor surface, which we believe was the internal floor of a Roman building. "We didn't find any evidence for the Roman wall, suggesting that we were just inside the line, but it's also possible that parts of it may have been recycled and used to build later buildings. It was certainly a worthwhile exercise and we will be providing a full report that will be of benefit to city planners." The nearest remains of the wall are inside Gloucestershire Furniture Exhibition Centre on the corner of Southgate Street and Parliament Street, and Blackfriars. Henry Hurst uncovered the wall at Bearland in 1969. It runs under Berkeley Street, to the nearest corner of the Cathedral, to St Aldate Street, through King's Walk, Brunswick Road, and Parliament Street. "They could have been just inside the city wall, if the wall is there," said Gloucester Civic Trust's Nigel Spry. "It may be that it's been taken away during later periods to use in other buildings." Dr. Jason Hardgrave, assistant professor of history, will present "The Catapult Connection: The Invention of and Inventing in the Middle Ages" at the USI Medieval Studies Forum to be held from 5 to 6 p.m. Wednesday, March 25, In Liberal Arts Center Room 1016. According to Hardgrave, we owe the creative minds of medieval Europe a great debt. Eyeglasses, books, universities, paper, and even the paper weight were all introduced in this "dark age" of history. Based on his infamous "catapults" class in the spring of 2008, Jason Hardgrave will present on two connected topics for this forum: technological inventions of the Middle Ages and pedagogical techniques and reasons for approaching the topic. He will discuss some of the significant inventions and innovations of the medieval period, and assess their impact on culture and history, as well as answering the question: What was the point of having students create and use their own catapults? For more information, contact Dr. S. Elizabeth Passmore, assistant professor of English, at epassmore@usi.edu. The 2009 Medieval Academy of America meeting will be taking place from Thursday, March 26th to Saturday March 28th in Chicago, Illinois. Over 400 scholars and graduate students are expected to attend the annual meeting, which is hosted in a different American or Canadian city each year. The conference, which includes the business meetings for the Medieval Academy of America and the Illinois Medieval Association, will largely take place at the Renaissance Chicago Hotel. The hotel has hosted other academic conferences, including a recent one by the Renaissance Society of America, which impressed the organizers of this meeting. Over 130 papers are being given over this three day conference, ranging from medieval travel writing to British Holy Women. Plenary speakers include Jaroslav Folda, on "Chrysography in Thirteenth-Century Painting East and West"; Patrick J. Geary, on "Whatever Happened to Latin? "; and Sara Poor speaking about "Sister Act: Gender, Reform, and the Devotional Book in Late Medieval Germany." Barbara Newman, Professor of English, Religion, and Classics at Northwestern University and chair of the program committee, explains that while many conferences focus on a particular theme, the Medieval Academy of America "seeks a broad range of topics to interest members in the very wide range of fields and disciplines that we cover." A special mini-conference is being held on Friday, March 27th, at the Loyola University Museum of Art. Entitled, Objects of Medieval Art in Chicago, Professor Newman explains that it will "celebrate the reinstallation of both the Medieval Collection at the Art Institute and the Martin D'Arcy Collection at Loyola...Many members of the art world and the two museum staffs will want to attend this small conference without having to join or register for the Medieval Academy." Thomas Bestul, Professor of English at the University of Illinois at Chicago and chair of the local arrangements committee, explains that countless hours have been spent on organizing the conference. "The planning has been underway for more than two years," he said. "We don't use a professional meeting planner, so everything is done on a volunteer basis. We have a working group of more than twelve persons who are faculty members from colleges and universities in the Chicago area." For those visiting Chicago, Professor Bestul offers some advice on what can be done in the city outside of the conference: "The Art Institute of course is not to be missed. The medieval galleries are in the process of being reorganized, and the new Renzo Piano modern wing won't open for a couple of weeks yet, but there is still much to see. An exhibit on Edward Munch is in progress now. The other attraction is the architectural fabric of Chicago itself. The Chicago Architectural Foundation offers great walking tours. An undiscovered gem is the Loyola University Museum of Art in the Water Tower area - the medieval collections have just been reinstalled in a wonderful new setting. A reception on Thursday at the Newberry Library will be a chance to become acquainted with that wonderful institution." Click here to go to the website for 2009 Medieval Academy of America Meeting. Last week we reported on a discovery made by Dr. Julian Luxford of the University of St. Andrews that a passage exists in a 15th century manuscript that reveals new information about the legendary figure Robin Hood - see this article for more details. We have now posted an Interview with Dr. Luxford, which is posted on our main Medievalists.net site. We ask about how he came across this interesting passage about Robin Hood and his work on the topic. You can also read his article An English chronicle entry on Robin Hood, which is published in the latest issue of the Journal of Medieval History. We invite submissions from various disciplinary, interdisciplinary, and comparative perspectives, focusing on individuals, single sects, or groups. If you are interested in contributing to this volume, please send your C.V. and a 250-500 word abstract of your proposed essay including your theoretical framework and your primary sources to Rebecca.Flynn@usiouxfalls.edu and Salvatore.Musumeci@usiouxfalls.edu by June 1, 2009. Salisbury Cathedral in Wiltshire, England, will be holding an exhibition from May to October this year to showcase the recent archaeological discoveries made by Wessex Archaeology and the Time Team television show. Salisbury Cathedral was founded in 1220, and the main building was completed within 50 years of the foundation, and the tower and spire, added later, were complete by 1320. The archaeological dig, conducted in 2008, explored an area next to the cathedral walls, plus the site of its original bell tower. They uncovered the foundations of the Bell Tower, the remains of contemporary workshops which may have belonged to the craftsmen working on the Cathedral building, and four graves. The exhibition features artefacts, photographs, and audio visual material from the programme, which was shown in February, and is located in the cathedral cloisters. There is also an ‘archaeology for beginners’ section giving an insight into the working methods and tools used by modern archaeologists. The exhibition runs from May 1 to October 31. 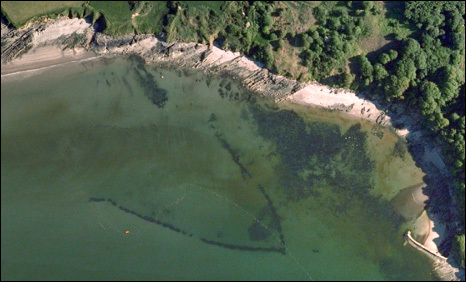 A large medieval fish trap has been found in an estuary in Pembrokeshire, Wales, after it was spotted in aerial photographs on Google Earth. The 260m (853ft) man-made V-shaped structure could be more than 1,000 years old, experts believe. They think it was designed to catch migratory fish, such as salmon and sea trout going up the River Teifi at Poppit in Pembrokeshire. Research is being undertaken between Pembrokeshire College and the Dyfed Archaeological Trust to find out more. The structure is about 3ft wide and protrudes about 12in above the underwater sand, although the water in it would have been shallower 1,000 years ago, when the sea level was lower. Fish would have swum into the estuary but become trapped in the structure as the water ran out with the outgoing tide. Dr Ziggy Otto, lecturer in the coastal zone and marine environment research unit at Pembrokeshire College, said: "There can be but little doubt that this rather impressive - and quite apparently man-made - structure is an ancient fish trap. The structure is entirely underwater (at all stages of the tide); it has never been surveyed, but is approximately 260m long, and is possibly made of locally quarried rock, although use of boulders carried in during the last glaciation cannot be ruled out either. Its age is unknown, but because of its now entirely sub-tidal position, this fish trap is very old, possibly dating back more than 1,000 years, when sea level was lower and the entrance to the Teifi Estuary further towards the Poppit side. This structure is a true conundrum, and certainly worthwhile investigating further, because it forms part of the historic and cultural seascape of the area. Louise Austin, of the Dyfed Archaeological Trust, said the find was very important. "Fish traps were a widely used means of catching fish in the past which made a significant contribution to the economy of many coastal and estuarine communities," she said. "Today only a few are known to survive in Wales. Recent aerial survey work has identified a handful of additional sites, such as the Poppit example, but there are few opportunities to investigate and record in detail these important underwater sites." An exploratory dive has already been undertaken by Dr Otto, together with Jennifer Jones, a scientific diver. Ms Jones said: "The section of the fish trap we dived on in very poor visibility is buried in the sand." She said the rocks forming the trap are now covered in worms, algae and sea anemones. "This fish-trap has therefore metamorphosed from an entirely man-made structure to a naturally functioning reef, which adds to the biological diversity not only of the local area but also to that of the Cardigan Bay Special Area of Conservation as a whole," she added. Further dives are now planned to complete a full underwater survey of the fish trap. The Academy of European Medieval Martial Arts(AEMMA) of Toronto, in cooperation with the Royal Ontario Museum will have an authentic reproduction of a 14th century tournament, complete with a colourful and heraldic pageantry of armoured combatants, heralds, marshals and a Patron, the Lord of Wrentnall. This event is scheduled for 12:30 - 4:30pm, Saturday, March 21 in the museum's Currelly Gallery. The tournament consists of a series of "combats on foot", with the defendants (home team) comprised of 5 armoured combatants from AEMMA, challenged by the appellants (visiting team) comprised of 6 armoured combatants hailing from as far away as Boston, Mass., this year's tournament featuring the first female armoured combatant. The bouts displaying martial techniques with sword, spear, poleaxe and dagger. More details can be found at the Academy's website. A freshly-discovered document highlighting negative attitudes towards Robin Hood has been deciphered by an academic at the University of St Andrews. The previously unknown chronicle entry introduces never before seen facts about "a certain outlaw named Robin Hood". Rather than depicting the traditionally well-liked hero, the article suggests that Robin Hood and his merry men may not actually have been "loved by the good". Dr Julian Luxford from the University's School of Art History found the reference to the legendary figure in an inscription from around 1460 which appears in an English manuscript owned by Eton College. Dr Luxford, an expert in medieval manuscript studies, explained, "The new find contains a uniquely negative assessment of the outlaw, and provides rare evidence for monastic attitudes towards him." The pre-Reformation article is the only English chronicle entry to have been discovered which mentions Robin Hood. To date, just three Scottish medieval authors are thought to have set Robin in a chronological context. Dr Luxford continued, "The new find places Robin Hood in Edward I's reign, thus supporting the belief that his legend is of thirteenth century origin." A translation of the short inscription, which contains only 23 words in Latin, reads, "Around this time, according to popular opinion, a certain outlaw named Robin Hood, with his accomplices, infested Sherwood and other law-abiding areas of England with continuous robberies." Dr Luxford said, "While Little John is not mentioned here, Robin is assigned partners-in crime. And the inscription's author does at least acknowledge that these men were active elsewhere in England. "By mentioning Sherwood it buttresses the hitherto rather thin evidence for a medieval connection between Robin and the Nottinghamshire forest with which he has become so closely associated." The discovery has been written up as an article which will be published later this month in the Journal of Medieval History. New evidence which reveals how the Vikings successfully blended into British and Irish culture long before they were consigned to history as barbaric raiders is to be presented at a Cambridge University conference. In a three-day event held from March 13th to 15th, leading scholars unveiled more than 20 cutting-edge studies which reveal how the Vikings shared technology, swapped ideas and often lived side-by-side in relative harmony with their Anglo-Saxon and Celtic contemporaries. Together, the research further revises our standard image of the Vikings, who academics argue should be seen as an early example of immigrants being successfully assimilated into British and Irish culture. "The latest evidence does not point to a simple opposition between 'Vikings' and 'natives'," Dr Fiona Edmonds, from the University of Cambridge's Department of Anglo-Saxon, Norse and Celtic, said. "Within a relatively short space of time - and with lasting effect - the various cultures in Britain and Ireland started to intermingle. Investigating that process provides us with a historical model of how political groups can be absorbed into complex societies, contributing much to those societies in the process. There are important lessons that can be gained from this about cultural assimilation in the modern era," her colleague, Dr Máire Ní Mhaonaigh added. The conference, entitled "Between the Islands", has been organised by the University's Department of Anglo-Saxon, Norse and Celtic and its Centre for Research in the Arts, Social Sciences and Humanities (CRASSH). Drawing on a combination of new archaeological evidence, historical studies, and analysis of the language, literature and coinage of the period, it aims to illustrate how between the 9th and 13th centuries, the Vikings became an integral part of the fabric of social and political life which changed Britain and Ireland far more profoundly than is often realised. • Research into Scandinavian settlement in Ireland showing it to have been much more varied than was once thought. Interaction between Viking incomers and Celts can be detected in many of the camps. • An examination of evidence for Scandinavian settlement in North-West England including archaeological remains (such as furnished burials) which point to early Viking settlements on the Cumbrian coast. • A new analysis of personal names in the Domesday Book which suggests that settlements established in Yorkshire, on the path used by travellers voyaging between Viking Dublin and Viking York, retained their Gaelic-Scandinavian identity until the Norman Conquest. • Investigations into Irish nautical activity indicating that it experienced a flowering in the tenth century perhaps in response to Viking prowess in this area. The key product of this development is "Skuldelev 2", an impressive Viking long-ship built in Dublin in 1042. • Recent studies of regional coinage from the period, which show that Viking rulers developed economies influenced by cultures they encountered on arrival. In East Anglia, for example, (where there had been a well-regulated coin economy), they adopted a similar system, but in other areas, where there had been only limited coin circulation, they introduced a bullion economy instead. • Evidence that those responsible for Ogam and runic inscriptions may have mutually influenced one another, as indicated by such monuments as stone crosses at Kilalloe (Co. Clare, Ireland) and Kirk Michael (Isle of Man). • Analysis of Old Norse literary works which shows that some of their features may have been borrowed from Gaelic story-telling. "There have been significant advances in our understanding of the impact that the Vikings had on Britain and Ireland in the early medieval period, and this conference shows that the three worlds were inexorably intertwined for hundreds of years," Dr Ní Mhaonaigh said. "We know that the Vikings were part of a much wider process of cultural cross-fertlisation that changed Britain and Ireland forever. This information changes the way we understand the early history of our own islands." Further details about "Between the Islands: Interaction with Vikings in Ireland and Britain in the Early Medieval Period", including a full programme and abstracts of all papers, can be found by clicking here. Rampaging hordes - or darlings of the Dark Ages? "Never before has such terror appeared in Britain as we have now... Behold, the church of St Cuthbert, splattered with the blood of its priests, despoiled of all its ornaments... given up as prey to a pagan people." The religious scholar, Alcuin of York, writing in the late 8th century, had just experienced a bad case of the Vikings. Fiery dragons had been seen in the sky, followed by the arrival of raiders in longboats. For the next two centuries, the pattern of mayhem continued, and the caricature of the Viking as a kind of Scandinavian pillage idiot became thoroughly established. Last week, a different picture of the invading Norsemen emerged from a conference of academics at Cambridge University. Far from disgracing themselves on our shores, the Vikings can now be seen as model immigrants, whose successful assimilation into British society holds lessons for our own time. Their image problem largely stems from their failure - what, with all that plundering to do - to find time to record their own history; meaning that chronicling their presence was left to those on the receiving end of their, shall we say, pragmatic approach to revenue gathering. "Most people's image of the Vikings centres on their arrival and the disruption it brought, but that only continued for a very short time," says Dr Máire Ní Mhaonaigh, a Cambridge professor of Celtic studies who organised the conference. "Afterwards they started building settlements and interacting with the locals and influenced them in many ways. They provide a clear example of how a particular group came into a sophisticated, established society and the resulting interaction was positive." Serious historians have long nursed doubts about the traditional image of the Viking as a hulking, mead-swigging sea-raider with an axe over one shoulder and a maiden over the other, but it played well in the popular imagination, enlivening books and movies, and until recently there was little of substance to refute it. The new evidence suggests that most Vikings were simply looking for a better life and, once in Britain, quickly established themselves as farmers, craftsmen and traders. "The Vikings weren't these big, hairy delinquents, they mostly came from the upper classes," says Ingmar Jansson of Stockholm University. "They were sophisticated and at the cutting edge of civilisation." Their big problem - the one that sent them forth - seems to have been the inhospitality of their native norselands. Arable land was scarce and the climate harsh. The Vikings' forays into other lands, say the Cambridge scholars, were more about survival than conquest. They were also about the deployment of some remarkably advanced technology. Their longships were fast and seaworthy, and the crews navigated them with astounding precision. They reached North Africa, the Middle East and Asia. In the 10th century, the bloodthirsty Viking chieftain Thorwald and his even more ferocious son, Eric the Red, having been expelled from their native Norway for a series of grisly murders, made their way by longship to Iceland, from where - after committing yet more murders - they were also expelled. This time they made it to Greenland, where, in the frustrating absence of anyone to murder, they founded a settlement from which Eric's bold and driven son, Leif Ericson, would later sail west to a place he called Vinland, almost certainly becoming the first European to sight America. How did the Vikings, in open ships with minimal room for even basic provisions, manage such epic voyages? Yet more technology, is the answer. They had learned to preserve cod by drying and salting it until it had lost 80 per cent of its weight and could be neatly stowed in the hull. This breakthrough vastly extended their reach, and made possible the five recorded Viking expeditions to North America between 985 and 1011. "The Vikings reconnected humanity and made the world a smaller place by travelling these huge distances," says the renowned Viking expert William Fitzhugh, of Washington's Museum of Natural History. "We can look back to the Vikings as the origin of human endeavour to find new horizons." Terrific. Unless you happened to be living on the new horizon when they arrived. The first recorded landing of Vikings in Britain dates to AD 787, when three ships, probably from Norway, came ashore on the Dorset coast. According to The Anglo-Saxon Chronicle, the historical annals compiled in the time of Alfred the Great, a reeve (tax collector) was sent to meet them. Apparently taking a dim view of the idea that they should pay mooring fees, the Vikings chopped up the taxman, leaving his body on the beach as a calling card. So began the legend of Viking terror. The raiding parties struck wherever there was booty or slaves to be taken, and their strategic range covered all of Europe. Ireland was so badly hit that a few years ago the Danish government felt obliged to issue one of those fashionably belated official apologies (accepted). Congregations in western France still pray: "From the wrath of the Northmen, Oh, Lord preserve us." Even allowing for historical exaggeration, there's no doubt the Vikings could be a tough bunch. Where, though, did the ferocity come from? Some scholars have suggested that they may have been using performance-enhancing substances - notably magic mushrooms that they collected on their travels. From this arose the myth of the "berserkers", the Viking super-warriors who, when in battle, would enter a frenzy, seemingly impervious to pain. Yet, away from the obligations of pillaging and plundering, the Viking was - according to the Cambridge consensus - a very different creature. He was obsessed with good grooming, fashionable appearance and personal hygiene, and, in this sense, could be seen as the first metrosexual. One medieval chronicler, John of Wallingford, records disapprovingly that the Danes "combed their hair every day, washed every Saturday and changed their clothes regularly." Nor did the comprehensive Viking wardrobe include a Hagar the Horrible-style horned helmet. This idea owes more to Wagner and the era of Teutonic romanticism than to anything the Vikings actually put on their heads. As far as archaeologists can tell, the standard headwear was a leather skullcap. For those who survived the initial introduction, the Vikings proved surprisingly good neighbours. They brought skills, art, lore and substantial add-ons to our language ("Ahoy!" being the Viking war cry) as well as contributing hugely to our civic development. The Vikings had a highly developed legal system, a rudimentary form of democracy and rights for women. Even so, they figured - wrongly - that they could do better. In September 1066, King Harald of Norway landed in northern England with 15,000 men, determined to complete a Viking takeover of Britain. At the Battle of Stamford Bridge, he was defeated, effectively ending the Viking Age. Not entirely, though, for they live on in our imaginations. And as an example of what even the most unpromising arrivals can achieve in time. FROM the moment they ransacked a remote priory at Lindisfarne in 793, the Vikings have had a bad press. The Anglo-Saxon Chronicle's entry for the year says the raiders made "lamentable havoc in the church of God in Holy-island, by rapine and slaughter", fixing the popular image of the Vikings for the next 1200 years. New evidence suggests many of the Norse invaders were in fact model immigrants. Historians were to try to redress the balance overnight, AEDT, at a conference at the University of Cambridge. They hoped to show that the Vikings who settled in Britain and Ireland were technologically sophisticated, swapped ideas and often lived in relative harmony with Anglo-Saxons and Celts. "The latest evidence does not point to a simple opposition between Vikings and natives," said Fiona Edmonds, of the Department of Anglo-Saxon, Norse and Celtic at the university. "Within a relatively short space of time -- and with lasting effect -- the various cultures in Britain and Ireland started to intermingle. Investigating that process provides us with a historical model of how political groups can be absorbed into complex societies, contributing much to those societies in the process. There are important lessons that can be gained from this about cultural assimilation in the modern era." The findings are based on new archaeological evidence, historical studies and analysis of the language, literature and coinage of the period. Together they illustrate how, between the 9th and 13th centuries, the Vikings became an integral part of social and political life in Britain and Ireland, and changed both countries more profoundly than is generally realised. Maire Ni Mhaonaigh, who has organised the three-day conference with Dr Edmonds, said: "There have been significant advances in our understanding of the impact that the Vikings had on Britain and Ireland in the early medieval period and this conference shows that the three worlds were inexorably intertwined for hundreds of years. "There is an Irish text called the Book of Rights from the early 12th century where the Vikings are presented as just another Irish territorial group, and another from the later 12th century where they are called on as allies. Of course, there is a particular type of text where the Vikings are presented as bogeymen, but the writers do it for a reason, often to glorify their own ancestors for defeating them." Studies of coins from the period show the Vikings were economically influenced by the cultures they encountered. In East Anglia, in southeast England, for example, they developed a coin economy similar to the previous system. "There is a sense that the Vikings adapted to the existing social and political structures that they found," Dr Ni Mhaonaigh said. "There was intermarrying between Scandinavian dignitaries and their English and Irish counterparts and the sources tell us that some of them adopted Christianity by the mid-10th century, which also helped." Flawed heroes, sympathetic monsters and haughty professors collide as this hefty poem is rescued from the grasp of 1,000 years of highbrow analysis and transformed into a defiantly raucous musical. Presented by San Francisco’s infamous Shotgun Players and New York's infectious Banana Bag & Bodice, this new SongPlay is an irreverent dissertation on art versus criticism in blood soaked Scandinavia! The award winning Beowulf: A Thousand Years of Baggage is written by Jason Craig with music by 2009 Larson Award Winner Dave Malloy, and directed by Rod Hipskind. The production will be presented at The Abrons Arts Center (466 Grand Street @ Pitt). Performances will begin Tuesday, March 31; Opening April 1 and runs through April 18, 2009. Tickets are $20 -$25 (March 31 is pay what you can) and can be purchased by calling OvationTix at 866-811-4111 or by visiting www.beowulfnyc.com. Shotgun Players and Banana Bag & Bodice have gotten down to work inspecting this classic poem—adapting its powerful narrative to make a new play that is part homage and part parody. Beowulf: A Thousand Years of Baggage combines Weillian cabaret, 40's jazz harmony, indie rock, electronica and Romantic lieder into a new musical voice, allowing the original epic poem and the language of modern musical theater a uniquely outrageous platform on which to unite. Banana Bag & Bodice an ensemble theatre company that works to redefine the traditional notion of performance through original texts and music has brought its own brand of outlandish, creative and poetic style to the downtown theatre scene for the past 5 years, creating such critically acclaimed favorites as Panel.Animal, The Sewers and The Fall & Rise of The Rising Fallen, mixing music and text with provocation, satire and whim. Shotgun Players is a company that exists to create fearless, provocative, relevant theatre. Over the past 18 years Shotgun has made a significant contribution to the modern theatrical canon with its bold, innovative commissions from playwrights such as Adam Bock, Marcus Gardley, Eisa Davis and Liz Duffy Adams. In time for Purim: a jug inscribed with a Persian love poem was recently discovered in excavations of the Israel Antiquities Authority in the Old City of Jerusalem. This is the first occurrence of such a vessel in Israel. A fragment of a pottery vessel most likely created in Iran of the Middle Ages (12th-13th centuries CE) was discovered in an archaeological excavation directed by Dr. Rina Avner, on behalf of the Israel Antiquities Authority, in the Old City of Jerusalem, prior to construction by a private contractor. The fragment is treated with a turquoise glaze and is adorned with floral patterns and a black inscription. While studying the artifact prior to publication, Rivka Cohen-Amin of the Israel Antiquities Authority discerned that the inscription on the neck of the vessel is written in Persian. The inscription consists of a line that was taken from a quatrain. The inscription, which was translated by Dr. Julia Rabanovich of the Hebrew University of Jerusalem, reads: "...was once the embrace of a lover that entreats..."
The phenomenon of a Persian pottery vessel inscribed with a poem is known elsewhere in the world; however, this is the first occurrence of such a vessel in Israel. The inscription will be published by Dr. Nitsan Amitai-Preiss of the Ben-Gurion University of the Negev, within the framework of the final excavation report. According to Rivka Cohen-Amin the words are from the Rubaiyat, by the poet Omar Khayyam. Khayyam was an astronomer, mathematician and one of the most famous Persian poets of the Middle Ages. The question of how the vessel came to be in Jerusalem is a mystery. Possibilities cited by the Antiquities Authority include that it was it brought to Jerusalem by merchants or that it could possibly have been a gift someone presented to a Jerusalemite of the time. This clay pot like a lover once in heat; a lock of hair his senses did defeat. We are sad to report the passing of June Mecham, Assistant Professor of History at the University of Nebraska. She passed away March 1, after a long illness, at the age of 35. Her research interests included women’s history and gender history, especially female spirituality and monasticism, as well as the interaction between material culture and devotional practices, space and performance in late medieval Germany. Dr. Mecham served as an assistant editor for the website Monastic Matrix, a scholarly resource for the study of women’s religious communities from 400-1600. Please also see this post from one of her friends. 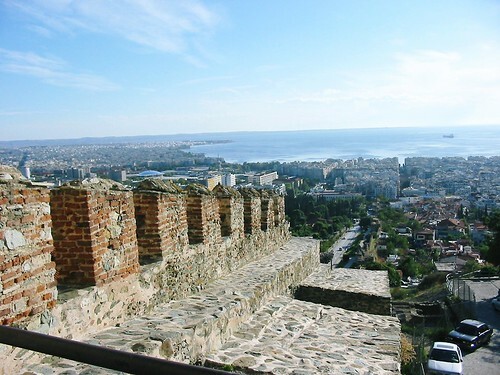 The municipality of Thessaloniki on Tuesday announced that it will soon restart a restoration and excavation programme aimed at further uncovering and showcasing the ancient metropolis' medieval walls. According to municipal officials, a further 20 old buildings and structures along Eptapyrgiou street -- all erected in the 20th century -- will be demolished. "Another 10 buildings were listed, the rest we can demolish and create a green space, next to the Byzantine walls," Thessaloniki Mayor Vassilis Papageorgopoulos said. The city, Greece's second largest, was founded in the fourth century BC by King Cassander of Macedon on or near the site of the ancient settlement of Therma in honor of his wife, Thessalonike, a half-sister of Alexander the Great. The name, in Greek, means "victory over the Thessalians". Cambridge University will observe 1,000 years of the Shahnama or book of kings by the Persian poet Firdausi in 2010. This epic verse was compiled in 1,010 AD which narrates the history of the Iranian people from the earliest times to the collapse of the Persian empire in the early seventh century. Firdausi's lifetime's work re-tells the myths and legends of ancient Iran, interweaving stories of the successive dynasties from the first king Kayumars down to the last Sasanian monarch Yazdagird III, with accounts of combats with monstrous beasts, hunting exploits and gargantuan feasting. It also introduces Zoroastrianism, the legendary conquests of Alexander the Great and the contest between Persia and Byzantium for dominion in the Middle East. Former Patna University history professor Surendra Gopal presided. He emphasised on the importance of the Persian language and Iranian cultural impact in the medieval Asiatic world. Library director Imtiaz Ahmad said the library enjoys distinction of possessing 80 copies of the Shahnamas, the largest single collection in the sub-continent. One of these copies was highly appreciated by Mahatma Gandhi who observed "its decorated pages are an eternal feast for the eyes." The German newspaperthe Kölner Stadt-Anzeiger reported Monday that the tragedy was likely caused by ground water seepage at the construction site. "Everything points to a problem with the ground water," a source told the paper. City prosecutors have now appointed several experts to determine exactly what happened at the underground railway construction site. They are trying to determine whether water seeped in through the more than one-meter thick concrete side wall or came up through the floor, which hadn't been finished. They are also looking into whether the problems might be related to rising levels of the Rhine River, which is located very close to the archive. Christian Hillen, who has been on the scene of the collapsed archive building in Cologne, Germany, has reported to Medievalists.net that more than 100 books from the medieval chronicles collection have been recovered undamaged so far. Furthermore, more than 200 folders with manuscript fragments (they were fragments before the disaster) were recovered also almost undamaged, while other manuscripts were found wet and needed to be shock frozen so they could be treated and preserved at another location. Mr. Hillen explains that debris is being removed from the site of the collapsed archive, and taken by truck to a recycling, where he and other volunteers search through the concrete and rubble for the paper and other archived materials. He adds that "spirits are quite high" among the workers, and that they expect more volunteers to arrive next week who will help speed up the process. Meanwhile, the body of a 17-year-old man was recovered early Sunday, March 8, under the rubble where the Cologne city archive building had collapsed. He had been in the top-floor apartment of an adjacent building at the time of the incident. According to an autopsy conducted Sunday afternoon, the young man likely died immediately in his sleep as the house caved in. A second man, 24, who lived in the same apartment building, has been missing since the city archives collapsed on Tuesday. The search for his body is still underway, with workers hopeful it may be found in the vicinity of the first victim. Search efforts, which couldn't begin until late Friday, were severely hindered by rain and the instability of the site and of neighboring buildings. Finally, officials from the city of Cologne have confirmed that the contents of the archive were insured for about 400 million euros. For the initial story about the collapse of Cologne's archive, click here. Mamluk Studies Review, a journal that focuses on the study of the Mamluk Sultanate of Egypt and Syria (648-922/1250-1517), has now become an online open-access journal. Their latest issue, Volume 13, Issue 1, is now available as a PDF file at http://mamluk.uchicago.edu/msr.html. Bruce Craig, editor of Mamluk Studies Review, made the decision to switch to an online version after the "financial situation at the University of Chicago has made it impracticable to continue producing MSR in conventional print format." There is no word yet if back issues of the journal will also be available online. Bruce Craig also noted that he will be stepping down from the position of editor following the second issue of this year's journal, and Marlis Saleh of the University of Chicago will take over the position. The historic victory of Robert the Bruce over Edward II at the Battle of Bannockburn is celebrated as one of Scotland's proudest moments, a rout by bravehearts determined to teach their southern masters a lesson after centuries of subjugation. An English academic has claimed, however, that the conflict ended with a whimper rather than a bang, with Edward's soldiers fleeing after just one hour and the Scots wasting precious time by looting corpses instead of chasing those who escaped. According to David Cornell, the author of Bannockburn: The Triumph of Robert the Bruce, the English troops were so exhausted and demoralised after two days of marching that they abandoned the battlefield at the first sign of a Scottish victory. The academic also maintains that the Scots missed a golden opportunity to crush the English by stealing trinkets and body armour from Edward's troops when they could have been pursuing those who escaped. Although some were captured for a ransom, others regrouped in England and were back on active service within a couple of months, he alleges. His account yesterday prompted a cross-border war of a different kind after leading Scottish historians accused Cornell of "making it up", and described his book as "less than impressive". Geoffrey Barrow, Emeritus Professor of Scottish History at the University of Edinburgh, and the author of many books on both medieval Scotland and Bruce, revealed that he had been asked to provide a "blurb" for Cornell's tome, which he believes was dropped because it was too critical. He said: "Yale University Press asked me to write a blurb which worried me because the author had let his imagination run riot a bit. I wrote a critique and communication was cut off because it wasn't what they wanted." Professor Barrow, who is also honorary president of the Saltire Society, and a former vice-president of the Royal Historical Society, said: "I was not tremendously impressed by the author. We have a lot of contemporary evidence that the crucial battle was on the second day but I don't think the Scots infantry would have been able to push a sizable English cavalry into muddy ground in a short while; it would have gone on a long time. There is no contemporary evidence that the Scots spent time looting English troops, nor any evidence they had anything valuable on them. All that is complete surmise." Fiona Watson, a senior historian and broadcaster, said: "I don't think anybody has been brave — or foolish — enough to say how long the battle lasted. The main bit of the battle wouldn't have taken that long. It would have been over when Edward II left the field and how long it took to get to that point nobody knows. Perhaps it was nearer to one hour than five, but after that you are just making it up." Dr Watson said that it was "strange" to suggest that Scots soldiers wasted the chance to go after the English. "Edward is the only person they failed to get; all historians agree if they got him the game would have been over," she said. "He was on a big warhorse and the Scots were on ponies, but James Douglas followed him to Dunbar, so they tried as hard as they could. As for the rest [of the English] they did try because they got a ransom for catching them and they wanted to make some money." The victory at Bannockburn on June 24, 1314, established Bruce as king of Scotland, and paved the way for independence 14 years later. The triumph was the sweeter because the Scots were vastly outnumbered by their English foes. Cornell, who has spent years researching the wars of independence, said that contemporary accounts undermined suggestions that Bruce's army killed 30,000 Englishmen. "The image of the second day of the battle is that it was a prolonged engagement in which the English were gradually slaughtered and suffered horrendous casualties, but if you look at the sources it doesn't really suggest that. It suggests that the English broke apart and the morale and the exhaustion of the marches of the previous days really contributed to that. The real importance of Bannockburn is that it has taken on these epic proportions, it's identified with Robert the Bruce and it's identified with Scottish independence." Ian Scott, chairman of the Saltire Society, said: "None of this diminishes the importance of the Battle of Bannockburn. It brought an end to the threat to Scotland for a generation. Many of the English may have retreated, and had they stayed it may have been a closer-run thing, but the victory in itself was enough for the Scots." Elly Truitt, an assistant professor of history at Bryn Mawr College, has been studying medieval history since her undergraduate years at Wellesley College. "To me, it feels like second nature to slip into the 12th century or 14th century, recognizing that my 21st-century assumptions may seem equally peculiar." But it wasn't until she had finished a master's degree program in medieval history at England's Cambridge University that Truitt discovered her true research interest: medieval technology and the occult sciences. This realization has led to a career specialty in the history of science and medicine in the Middle Ages. Truitt is currently at work on a book about automata, or self-operating machines such as robots, in the medieval West. This interest was sparked when Truitt, who had just decided not to pursue a doctorate in medieval history, was helping her former undergraduate adviser conduct research in preparation for a lecture on art and science in the Middle Ages. "She thought automata would be a good hook for her audience," Truitt recalls. "It was fascinating. I said to her, 'This would be a good book project for you.' She said, 'No; it would be a good book project for you.' "
Thus inspired, Truitt pursued a Ph.D. in the history of science--a field she had largely been unaware of--at Harvard University. Truitt arranges medieval automata into three broad categories: historical automata (objects assumed to have actually existed, based on the historical record--such as a water clock given to Charlemagne by the caliph of Baghdad--or plans for objects that were designed but never built); textual automata (fantastic imaginary objects that appear in a magical context in literature); and a much smaller category, surviving objects (the earliest of which is a mechanical rooster from Strasbourg, in Northeastern France, dating to 1350). There were also "weird legendary artifacts," such as prophetic talking heads that were animated by demons or the alignment of the stars, Truitt says. Many of these objects entered into the European consciousness via contact with the East. "Diplomatic gifts, or things that travelers saw or heard of, later showed up in changed or more elaborate form in the literature," Truitt says. "People were grappling with the East as a place with much more advanced technology and scientific knowledge. This was seen as exciting, but intellectually and morally disturbing." Over time, she says, the objects "become decoupled from their 'problematic' Eastern origins." Away from her office, Truitt is a fan of science fiction, especially books and movies involving "robots, cyborgs, and androids in modernity and post-modernity." In her research, she tries to transcend modern notions of progress. "I try to teach my students to be compassionate and to withhold judgments about the medieval period, and especially medieval science," she says. "That can be very challenging. You have to step back and recognize that there's an entirely different way of looking at the world, and an entirely different way of framing questions." For example, Truitt says, magic, today discredited as superstition, "had a totally different framework, and a highly rational one." Truitt, who teaches a course on magic, says the distinction between science and magic is "less of a line and more of an overlap." Both are investigations into the natural world, she notes. "The distinctions are very blurry and very permeable." Furthermore, Truitt says, people in the Middle Ages grappled with many of the same issues that today's scientists are investigating: artificial intelligence, where one should draw the line between life and "not life," and the ethical and moral questions involved in replicating nature. In medieval times, Truitt notes, scientific and technological innovation was being conducted in a diverse array of settings--"in universities, on voyages, in courtly settings, by artisans, shipbuilders, and theologians." Yet, Truitt points out, other than the study of medieval medicine, which she calls "a vibrant and exciting field," many aspects of medieval science remain unexplored. "The subfield has historically focused on Aristotelian philosophy, optics and physics," she says. "But there is so much we don't know about natural history," including, for example, medieval people's view of fossils. "Looking at manuscripts is probably one of the best things about being a medievalist," says Truitt, who has traveled across the United States and Europe to review primary sources. "I look at a lot of incredibly beautiful manuscripts, which is intensely pleasurable. I also look at scraps of paper, such as household accounts, which is also exciting, but in a different way." But some of these texts are disturbing, Truitt notes. "At first, I used to get very angry about the misogyny, the anti-Semitism, the Orientalism--the incredible bigotry and violence and hatred. But that's the world they were living in, and our own is not as far removed as we might like to believe." For those wanting to follow in her footsteps, Truitt advises persistence. "It can be really exciting, and kind of difficult," she says, "to explain to the general public that science isn't just this shiny new thing that started with the scientific revolution in the 16th and 17th centuries." Patricia Sutherland, curator of the Canadian Museum of Civilization, is a widely known North American archaeologist who has undertaken pioneering research into the history of remote Northern regions of the continent. She will discuss “A New Perspective on Native/Norse Contact in Arctic Canada” at 7:30 p.m. Wednesday, March 4, in Giffels Auditorium, Old Main. The lecture, the final Robert L. Stigler Jr. Lectureship in Archaeology of the academic year, is free and open to the public. Since 1975, Sutherland has been involved in archaeological research throughout Arctic Canadaandhas collaborated on a number of international projects in Greenland. Her recent research is focused on the question of Norse/Aboriginal contact in the Eastern Arctic in the centuries around A.D. 1000. A Fellow of the Arctic Institute of North America, Sutherland is the recipient of the Lowell Thomas Award from the Explorers Club of New York for her accomplishments in field research and scientific exploration. She has also received the Canadian Museums Association’s Award for Outstanding Achievement in Research, as well as its Distinguished Service Award for significant contributions in museum work. Among her publications are The Franklin Era in Canadian Arctic History, 1845-59 and “Norse and Natives in the Eastern Arctic” in The Viking World. The Stigler Lectureship honors Robert Leath Stigler Jr., an honors graduate in 1939 of Pine Bluff High School who attended graduate school at Columbia University and received a Ph.D. in anthropology in 1954. Most of Stigler's professional career was associated with Columbia, where he served as a lecturer and projects administrator. He also served as an assistant professor at Brandeis University and as the director of that university's Middle East Archaeology Project to Iran and Israel. He was a Fellow of the American Anthropological Association and held memberships in the Society for American Archaeology and the American Association for the Advancement of Science. Dr. Amy Eichhorn-Mulligan of the University of Memphis will speak at Appalachian State University Tuesday, March 17. Her talk, "'Secret and Distant Freaks' in the Medieval Irish and Viking Worlds," will begin at 6 p.m. in room 004 of Old Library Classroom Building. The lecture is free and the public is invited. Sponsors are Appalachian's Department of History in conjunction with Eastern Carolina University and Longwood University. Eichhorn-Mulligan is the author of "Sovereignty's Body: The Anatomy of Power and the Miracle of Kingship in Irish Literature" published by Speculum in October 2006. She is an associate professor in the Department of English at the University of Memphis, located in Tennessee. For more information, call Mary Valante in the Department of History at 262-2282. Adam Shear, Pitt assistant professor of religious studies, is the winner of the prestigious National Jewish Book Award in the Scholarship category for his book "The Kuzari and the Shaping of Jewish Identity, 1167-1900" (Cambridge University Press, 2008). The book follows the influence of the Kuzari and the way it has been read and understood over the years. Reviewer Matt Goldish-author, scholar, and the Samuel M. and Esther Melton Professor of History at Ohio State University-describes Shear's book as a "masterful treatment" of the history of the "Kuzari," a 12th-century treatise composed in Arabic and an influential classic defense of Judaism by Spanish Jewish philosopher and poet Rabbi Judah Halevi, who lived in both Muslim and Christian societies. "In the course of following the "Kuzari" through history," says Goldish, "Shear sheds a great deal of light on a series of widely disparate intellectual milieus." Shear surveyed the activities of readers, commentators, copyists, and printers that had taken place during 700 years to trace the ways the "Kuzari" became a classic of Jewish thought. In the course of his research, he found that conceptions of the work before the 19th century differed significantly from 20th century views. In modern Jewish thought, the "Kuzari" bhas often been contrasted with Moses Maimonides' "Guide of the Perplexed." "While Maimonides and the Guide have been seen as representing a rationalist understanding of Judaism, Halevi and the "Kuzari" bhave often been seen as antiphilosophical and antirationalist," according to Shear. That may be an accurate understanding of what Halevi and Maimonides intended, Shear says, but his research found that medieval and early modern Jewish readers did not always see a sharp contrast between the two works. "Although the "Kuzari" btook an antirationalist position and offered a strongly ethnocentric view of Jewish identity, it also included a great deal of philosophical discussion and other information on Jewish history and practice. Many medieval and early modern Jewish intellectuals found the "Kuzari" b compelling and useful in forming visions of Jewish identity that tried to reconcile reason and faith and to negotiate between universalism and particularism," Shear says. One of the implications of Shear's research is a new focus on the 19th century as a period in which medieval and early modern paradigms for understanding Judaism were transformed and new ways of reading classic Jewish texts emerged. The National Jewish Book Awards is the longest-running North American program of its kind in Jewish literature and is recognized as the most prestigious. Awards are presented in 16 categories and are designed to recognize outstanding books, stimulate writers to further literary creativity, and encourage the reading of worthwhile titles. The winners will be honored March 5 at a gala awards ceremony at the Center for Jewish History in New York City. Shear joined the Pitt religious studies faculty in 2001. His areas of expertise include medieval and early modern Jewish cultural and intellectual history, the impact of print on Jewish culture and thought in the early modern period, and the cultural role of Jewish philosophy in the formation of early modern Jewish identities. The remains of a 'vampire' have been found in a grave in Venice lagoon, an Italian forensic anthropologist has claimed. Matteo Borrini of Florence University said he and his team discovered the skeleton of a woman dating to the Middle Ages whose skull had been impaled through the mouth with a brick - a traditional method of ensuring undead bloodsuckers could no longer feed. Borrini told a meeting of the American Academy of Forensic Sciences in Denver that when Europe was in the grips of the plague there was a widespread belief that the disease was spread by female vampires. This idea probably originated from the dribble of blood that often came from the mouths of plague victims when they died, Borrini said. It was thought that these vampires, who were buried next to the bodies of plague victims, fed on their dead neighbours until they felt strong enough to rise from the grave and begin feeding on the living, perpetuating the cycle of contamination. Gravediggers were therefore responsible for identifying possible vampire women among the dead by signs of shroud-chewing around the mouth and impaling them with a brick to stop them feeding, according to Borrini. The woman's skeleton was found in mass grave of victims of the Venetian plague of 1576 - in which the artist Titian also died - on the small island of Lazzaretto Nuovo. Venice authorities had designated the island a quarantine hospital in 1468 following an earlier plague epidemic. Borrini said gravediggers had shoved the brick into the woman's mouth with such force that it had broken some of her teeth. When a later wave of the Black Death swept through Venice between 1630 and 1631, the epidemic claimed 50,000 of the cosmopolitan city's 150,000 inhabitants - or one in three people. Legends of vampirism has existed for millennia in various civilisations but the modern figure of the vampire originates with stories from the early 18th century Balkans and Eastern Europe. After a spate of alleged sightings, vampire frenzy spread to Western Europe and was later popularised in Bram Stoker's 1897 novel Dracula. Culture Minister, Barbara Follett, has placed a temporary export bar on a medieval historical manuscript known as The Courtenay Compendium. This will provide a last chance to raise the money to keep this exceptional manuscript in the United Kingdom. The Minister's ruling follows a recommendation by the Reviewing Committee on the Export of Works of Art and Objects of Cultural Interest, administered by the Museums, Libraries and Archives Council (MLA). The Committee recommended that the export decision be deferred on the grounds that the Compendium is of outstanding significance for the study of medieval historical scholarship. The Courtenay Compendium is a late 14th-century English decorated manuscript on vellum containing significant texts of British, Near-Eastern and Far-Eastern historical accounts, including the Encomium of Queen Emma and The Travels of Marco Polo. Some of the texts are rare, or even unique versions. The Compendium may have been assembled by a monk in the Augustinian priory at Breamore in Hampshire in order to provide his house with a scholarly collection of important historical texts. These were possibly copied from sources in the library of Glastonbury Abbey, the chief medieval library in the south west of England. At the Dissolution of the Monasteries, Braemore Priory was granted to Henry Courtenay, Marquess of Exeter. This volume was certainly in the possession of his descendants in the eighteenth century. The most significant text in the Compendium is the unique medieval witness to the revised version of the Encomium of Queen Emma, an anonymous biography commissioned by its subject in order to promote the political interests of her offspring. Emma of Normandy, great-aunt of William the Conqueror, was the wife of two 11th-century English kings, first of Aethelred II, known as "the Unready" and, after his death, of his successor, the Danish Cnut. She also bore two sons who later became king, Harthacnut and Edward the Confessor. The inclusion of eastward-looking texts in the Compendium adds to its importance, as they occur in few medieval English manuscripts. Marco Polo's account of his travels on the Silk Road was central to the West's perception of Asia for many centuries, but is known in only four other manuscripts of English origin. The State of Saracens and Mohammedans by William of Tripoli, a Dominican monk in the convent of Acre in the 13th century, is a positive presentation of Muslim life and faith. These texts are key to understanding English perceptions of the Near and Far East during the Middle Ages. Dr Christopher Wright, Reviewing Committee member, said: "The Courtenay Compendium, which has hitherto been unknown to scholars of Anglo-Saxon history, is a rare and remarkable discovery. It is a major source for the study both of pre-Conquest English history, and of medieval England's perceptions of the wider non-Christian world." The decision on the export licence application for the Compendium will be deferred for a period ending on 3rd May inclusive. This period may be extended until 3rd August inclusive if a serious intention to raise funds with a view to making an offer to purchase the manuscript at the recommended price of GBP937,250 is expressed. Offers from public bodies for less than the recommended price through the private treaty sale arrangements, where appropriate, may also be considered by Barbara Follett. Such purchases frequently offer substantial financial benefit to both parties by the sharing of tax advantages. The evolution of the postcard is the subject of a talk by Kathryn M. Rudy, a world-renowned expert on medieval devotional art. She will speak on Tuesday, March 24, at 5:30 p.m. in room 107 of Syracuse University's Hall of Languages. Free and open to the public, the lecture is sponsored by the Department of Art and Music Histories in SU's College of Arts and Sciences. Rudy is keeper of illuminated manuscripts at the Koninklijke Bibliotheek (The Royal Library, the Dutch equivalent of the U.S. Library of Congress) in The Hague. For more information, call (315) 443-4185. Rudy traces the postcard's origins to 1490, when a nun inscribed the back of a single-leaf, miniature painting of St. Barbara and sent it to another nun. The recipient then placed the folio, "scrap-book style," into a manuscript prayer book, where she cobbled together a selection of other images, presumably gifts from other nuns. Laurinda Dixon, professor of art and music histories at SU, says that these beautiful, personalized paintings were, in effect, the first postcards, with an image on one side and a greeting on the other. "Dr. Rudy links this medieval practice to modern postcards, which we send to friends and family members and save as mementos," she adds. Rudy is not a deltiologist, or postcard collector, in the conventional sense. The former Cornell mathematics professor specializes in devotional art, particularly Middle Dutch manuscripts, from the 1300s-1500s. She also is interested in prayer books. Currently, Rudy is working on a book project about the use of medieval prayer books as talismans to ward off evil, disease and sudden death, as well as a book about virtual pilgrimages in the Middle Ages. In addition to being a sought-after author and public speaker, Rudy has taught art history at numerous institutions, including Columbia University, Barnard College, Brooklyn College, the University of Oregon, University College Utrecht and the University of Amsterdam. In 2005-06, she was the Samuel H. Kress Fellow at the Warburg Institute, London. Rudy earned a licentiate in mediaeval studies from the University of Toronto, as well as a Ph.D., M.Phil. and M.A. in art history from Columbia University. More information about SU's art and music histories (formerly fine arts) department is available at http://thecollege.syr.edu. High-quality films are the best promotional campaign of Bulgarian monuments of culture, Prof. Nikolai Ovcharov said at a news conference in BTA's National Press Club on Wednesday. He presented three new films of a Bulgarian National Television (BNT) team dedicated to medieval Bulgarian fortresses. "We decided to place the scripts on a broad historical basis," said he. The first film of the series, "The Fortresses of Achridos", presents the emergence, existence and decline of the fortresses, built in the area of the Eastern Rhodopes - Perperikon, Ustram Vishergard and Lyutitsa up to Ivailovgrad, Mezek and Svilengrad - at the time of the Byzantine Empire and the Second Bulgarian State. The second film, "Kaloyan's Campaign", dwells on the ruling of Kaloyan, who headed the uprising against the Byzantine occupation resulting in the restoration of the Bulgarian state. Part of the film was shot in Didymoteichon (Greece) and Edirne (Turkey), Ovcharov specified. The third film, "The Ottoman Invasion", tracks the marches of the Ottoman Turks. The film was shot in the Pythion Fortress in Greece. It shows the first sultan's mosque in Europe, located in Didymoteichon, as well as the Selimiye mosque in Edirne. Dessy Shishmanova, Director of BNT Studio in Plovdiv, said that there are plans to release the films on CD and dub them in foreign languages. Cologne's six-story city archive building rumbled and then collapsed into a pile of rubble Tuesday. Many people inside were able to flee to safety, but authorities said they were searching for two to four people missing from nearby buildings. Cracks and groaning noises had alerted staff and visitors at the archive, all of whom escaped before it collapsed. Some of Germany's most valuable documentary treasures may have been destroyed, wiped out in the three minutes it took for a six-storey building to become a pile of smouldering brickwork on Tuesday afternoon. If they are ever recovered, the documents will almost certainly be irretrievably damaged. "We are talking here about 18 kilometres of extremely valuable archival material, of absolute importance to European culture," Eberhard Illner, the head of the city archives, said. "Now the memory of a European city has been destroyed. I can only hope, but cannot believe, that some of these fragile documents survived under tonnes of concrete and steel." The archives included the minutes of all town council meetings held since 1376. Not a single session had been missed, making the collection a remarkable resource for legal historians. The earliest document stored in the building dated back to 922, and there were hundreds of thousands of documents spread over six floors, some of them written on thin parchment. A total of 780 complete private collections and half a million photographs were being stored. "Even if there isn't something that hasn't been pulverised or destroyed by water, it will take decades of restoration work," said the historian Joachim Oepen. When the building was constructed, a small nuclear-bomb proof chamber was included in the cellar to protect the most precious pieces. But in recent years, the chamber has been used only to store cleaning material. There was even less warning of the collapse of the building than would have been given during a nuclear attack. Workers on the rooftop heard a cracking noise and immediately alerted the 26 people using the archives at the time. Less than three minutes later later, the building was flat. If there are human victims, they are entombed under an amusement arcade that adjoined the archives. The fire brigade said today that there might be two or three people crushed under the tangled girders, but that their chances of being found alive were diminishing by the hour. Staff at the archives first noticed cracks in the cellar early last year, but the building was deemed safe. Preliminary blame is being laid on the construction nearby of a new underground railway station. Gregor Timmer, a spokesman for the city of Cologne, said rescuers needed to stabilise the remains of the structures before moving into the rubble to determine whether anyone was trapped inside. "The buildings to the left and right of the collapse site are severely damaged and are in danger of partly falling down. That is why rescuers are currently unable to step onto the rubble," he added. On Tuesday evening, concrete was pumped into the ground to firm it up. Two hundred rescue workers are still at the scene. The six-storey building collapsed at about 1400 local time (1300 GMT), bringing down two other neighbouring buildings. One witness said the scene resembled a Hollywood movie as cracks slowly spread up the building's facade before it collapsed in a cloud of dust. Authorities in Cologne have evacuated buildings within a 150m radius around the site, including two schools and a retirement home. Christian Hillen, who has been at the site of the disaster to help rescue the documents, reports that 40 of the 65 medieval charters have been found so far. The Journal of Medieval Iberian Studies has launched its inaugural issue. Published by Routledge, it covers archaeology, art and architecture, music, philosophy and religious studies, as well as history, codicology, manuscript studies and the multiple Arabic, Latin, Romance, and Hebrew linguistic and literary traditions of Iberia, over the period from the fourth century to 1492. It will be published twice a year. The online database Informaworld publishes the journal online. Click here to access its website. The Afghanistan city of Herat, an important medieval center in Central Asia and capital of Timurid Empire, is now being restored by the Aga Khan Trust. Meanwhile, a construction boom is threatening to destroy other historic buildings.